The murder of Saudi journalist Jamal Khashoggi is not an issue of Turkey but of the whole world, said Turkish president Saturday. 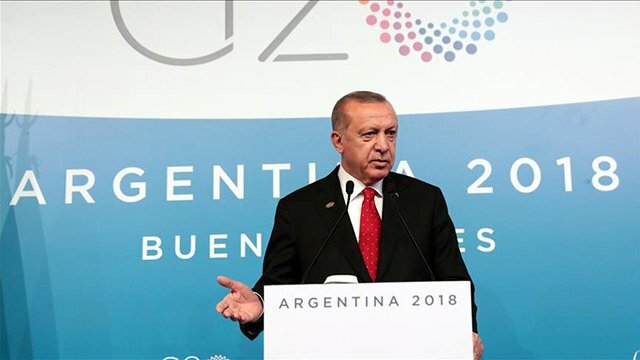 Speaking at a news conference at G20 Summit in Buenos Aires, Argentina, Recep Tayyip Erdogan said Turkey has never seen the Khashoggi's murder as a political issue. "For us, this incident is a vicious murder and will remain so," said Erdogan. Turkey has called for the extradition of the killers for trial in Turkey where the crime took place. The Turkish leader said that Ankara mobilized all efforts since the beginning of the brutal killing of Khashoggi. Despite repeated denials from the Saudi authorities, the killing was revealed thanks to Ankara's "determined stance", he added. He stressed that neither Islamic world nor the international community would be satisfied until revealing of all those responsible for murder of the journalist. Erdogan said Turkey has never intended to harm Saudi Arabia or Saudi royal family. "We believe that it will also be in the interest of Saudi Arabia to clarify all aspects of the murder and prosecute all perpetrators," said the president. On Yemen, Erdogan said the crisis in the war-torn country must be resolved urgently. "The pain of Yemeni people must be finished as soon as possible. The independence, sovereignty, territorial integrity and unity of Yemen should definitely be protected," Erdogan stressed. An estimated 8.4 million people in Yemen are at risk of severe famine and more than 22 million people, or 75 percent of the population, are in need of humanitarian assistance. Impoverished Yemen has been wracked by conflict since 2014, when Houthi rebels overran much of the country, including the capital, Sanaa. The conflict escalated in 2015 when Saudi Arabia and its Sunni Arab allies launched a military campaign aimed at rolling back Houthi gains in Yemen and shoring up the country’s Saudi-backed government. The war has resulted in a collapsed economy and a cholera outbreak that has affected over 1.1 million people. Riyadh has repeatedly accused the Houthis of acting as a proxy force for Iran, Saudi Arabia’s arch-foe in the region. Turning to the situation east of Euphrates river in northern Syria, Erdogan said Turkey will clear east of Euphrates in northern Syria from PKK/YPG terror group in the near future. "We will not allow any structure in northern Syria that poses threat to the security of our country and region," he stressed. YPG/PKK terrorists currently occupy some 28 percent of Syrian territory. A possible mission east of the Euphrates, which Turkey’s leadership has been suggesting for months, would follow two successful cross-border Turkish operations into Syria, Euphrates Shield and Olive Branch, both meant to eradicate the presence of the terrorist YPG/PKK and Daesh near Turkey’s borders. He said Turkey will keep taking necessary measures as long as Greek Cypriots continue their "aggressive policies" ignoring basic rights of Turkish Cypriots. Erdogan said Turkey will not allow usurpation of northern Cyprus' rights on hydrocarbon resources in eastern Mediterranean. The eastern Mediterranean island has been divided since 1974, when a Greek Cypriot coup was followed by violence against the island's Turks, and Ankara's intervention as a guarantor power.